Sometimes a facelift is all your bathroom needs to give it a completely new look and life. If you don’t want to take on a major bathroom remodeling project, then consider some of the following ideas for a facelift. You’d be surprised how much of a difference a new paint job and some new hardware can make! Keep on reading for some great bathroom facelift ideas. New faucets are a great bathroom facelift. Bathroom hardware includes things like your cabinet knobs, door knobs, towel hooks, shower curtain rods, etc. Over time, these can become dull and worn out looking. Simply replacing them with new hardware is a great place to start with your bathroom facelift. An easy DIY project that can be done by any homeowner in a few hours. The thing about bathroom lighting is that the usual trend of installing a light fixture over the mirror actually creates shadows that mask your face when you look in the mirror. Swap out that ceiling fixture for a pair of wall-mounted fixtures on each side of the mirror. You’ll be amazed at the difference this makes in the quality of light in your bathroom. A new paint job is a great way to liven up your bathroom. Choose a light, neutral color, which will make the space lighter and feel bigger than it is. Another great DIY project. Depending on how far you want to go with this bathroom remodeling tip, you can really make a big upgrade to your bathroom. Start with the faucet and switch it out for a nice shiny new one. If you want to take it a step further, opt for a whole new sink. 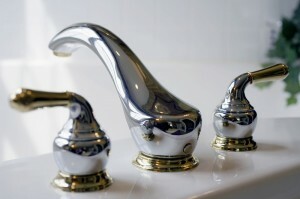 In fact, replacing the sink and faucet at the same time is often easier than just replacing the faucet itself. Or, choose a new vanity top with a sink built in. This is a more involved project, and can be done either DIY or by a bathroom remodeling contractor. If it’s been awhile since you had a new toilet put in, it’s well-worth it to consider one. Not only will a new toilet look a lot nicer than an old one, it will probably save you water too, as new toilets use much less water per flush than old ones. This entry was posted on Tuesday, June 9th, 2015	at 6:21 pm	. You can follow any responses to this entry through the RSS 2.0	feed. Both comments and pings are currently closed.